Collaborations in the cheese world are becoming an important and fun way of expanding flavors. This year some very prominent collaborations won big at the American Cheese Society conference so it's no surprise that we start to see them pop up left and right in counters across the country. This week I decided to take one of my new favorite cheese collaborations and use it to frame the Friday Pear. Crown Finish Caves in Brooklyn have become quite a name for themselves and their products. Nestled in lagering tunnel from the 1850's, these aging caves have breathed new life in a multitude of cheese. Affinage is the art of aging cheese and it is crucial to the end flavor. Crown Finish buys "green cheese" and ages it until they feel it's at its top flavor profile. Often they will completely change the profile by washing the cheese in beer as it ages, which helps promote certain bacteria and flavor profiles. Every cheesemaker has to have a place that can age their cheese though most just have a temperature and humidity controlled room that they take care of the affinage in. It's a long and arduous process since the cheese still needs weekly, or sometimes, daily attention. These days a lot of makers feel it's best to let someone that is very skilled in affinage do the work. 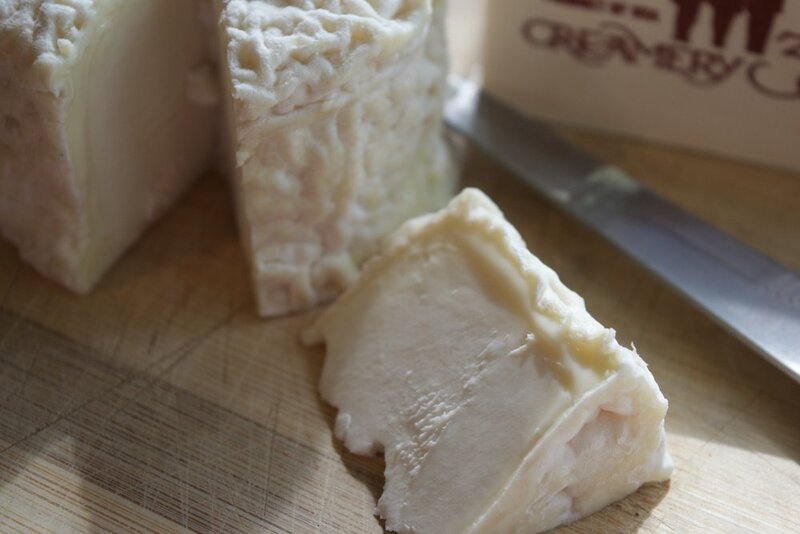 It's no surprise that Creamery 333, a new line of French inspired but American made cheese, would use Crown Finish to help with their products. Creamery 333 is a collaboration of some of the top French names in the industry and while anyone in the business can tell you the difficulty of importing cheese these days, Creamery 333 decided it was time to just bypass the importation issues by making cheese right here in the States. They have started with two goat cheeses of completely different styles. The first is a natural rinded tomme named Trivium and the second is a soft goat cheese reminiscent of the cheeses coming out of the Loire Valley called Tricycle. Made in Wisconsin and transported to Crown Finish to age, they are both fantastic and a representation of what American cheesemaking is; inventive with a nod to European tradition. I chose Tricycle because those little goat pucks are some of my favorite style of cheese. Bosc pears have a tendency to be sweeter earlier in the ripening process and have a firmer more dense flesh so they can be great used in baking and poaching at any stage of ripeness. Their classic "pear" shape and the russeting of their skin makes them unique in the pear world. The history of the Bosc is an uncertain one but it is certain that they were discovered sometime in the early 1800's. Bosc are found to do very well in the soil and climate of the Pacific Northwest and though they had started growing them on the East Coast, most Bosc come from this part of the country now. Their unique shape and skin has made them fodder for many artists throughout their history. All of this culminates to one of the easiest desserts I've put together. I knew I wanted baked pears and honey but it's rare that I don't include some sort of cheese somewhere so here it is: Baked Bosc and Tricycle with honey, cinnamon, and cardamom. Simplicity at its best. Cut and core the pears in to halves, drizzle honey, shake a little cardamom and cinnamon, add a slice of Tricycle, and bake at 350 degrees until the sweet smell of pear fills your kitchen, usually about 15-20 minutes. The cheese has a slight earthy funk that is offset by the sweetness of the honey and pear while the cinnamon and cardamom bring an extra layer to the creaminess and slight tang of the cheese. I could eat this almost every night for dessert. How do you use cheese as a dessert? 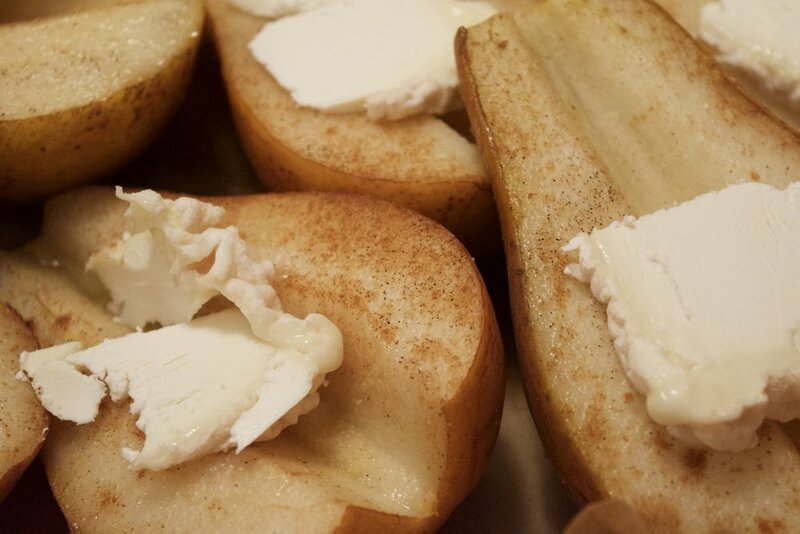 How do you bake your pears? I wanna know!